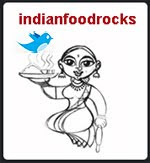 Indian Food Rocks: Shout Out: Pickle time! Last year I had promised to post a reminder when it was time to make lemon and lime pickle in the sun (in the US). The sun is out, the days are long and the time is right. If you can get hold of organic limes and lemons, more power to you! I looked high and low (ok! just in Sunnyvale Farmers' Market) for Meyer lemons but found none. I saw organic Eureka lemons and I am kicking myself for not bringing some home with me. I had to settle for Citrons and Persian limes. Don't forget to wash them well to get rid of the coating made of bees-wax. Manisha thats some chatak_dar pickle. Just what I need right now. I have last year's pickle carry over as I went completely overboard with pickle making. So did new things this year like the sundried tomatoes and rains have started here long ago so no more sunning. Oh yes!! This is great! Thanks for reminding me too. Ever since I saw that post last year I thought I'll have to make this next year. Manisha - you rock! Guess what!!!! I am making a batch of no-oil lemon pickle today! I have been thinking about it ever since I read your gorgeous post, and I now have the jar, and the lemons ready. BUT it was cloudy and rainy all of last week. Today, I'm willing the weather to be sunny, and making the pickle this very morning. Does the pickle work on "partly sunny with a chance of thundershowers" days?? I'm going to leave mine on the windowsill (don't have a yard). mansiha's lime pickle is cooking away in my backyard. yesterday a maharashtrian friend who droipped by saw it, drooled, and placed a back order. Do the limes stay green for a long time? That is great colour for a pickle. Manisha I am going to narrte a story it will truly help understand why your post has made me so happy so please bear with me. DH loves lemon pickle and my MIL makes awesome lemon pickles, as luck would have it my brother was visiting home and was entrusted with the job of bringing along a bottle but as all things with inlaws go my brother left it behind at the airport (too much weight and OIL seeping out). DH was terribly disappointed and I am not still able to live it down because it was MY BROTHER who left it behind that too at the airport. So when I make this lemon pickle and there are smiles and praises I will think of you very fondly I promise. thanks for reminding manisha... it has been on my mind. I even bought limes and lemons...waiting for one good sunny day! Great post. I've never had this type of pickle, but I'm quite intrigued by it. I think I'll have to try some. Oh Thanks for the reminder! I want to make this time! This unblvable pickle! Tada..yummy yummy pickle..But I don't have a jar..Can I still make it? Anjali, sun-dried tomatoes! Thanks for reminding me. I want to do that this summer, too! I have chunda on my list, too. I had sandge after years and years in SFO and I want to make those, too! I'll be happy if I manage to get some of these things made! Let's see! Only time will tell cos this summer is as busy as the last summer! Meeta, a Happy Birthday month to you! I don't think I will be able to bring something to your Mingle this time. By the time these pickles are ready, it will be the end of June, if not later. So you have a wonderful birthday, sweetie! And, thank you so much! Nupur, see Pel's comment above (just below yours), a comment he made on my lime pickle and this. If the pickle doesn't get enough warmth during the day, try putting it in the oven with the lamp on. My sister typically makes these in 'winter' in Bombay in her balcony. So I think you should be fine doing this on the window-sill. Do let me know how it turns out and if you found a few tricks along the way! Pel, you're a real sweetheart and yes, I know you wouldn't say nice things just to please me. Boy, do I know! :-D I'm so glad you love this recipe! I need to tell my sister that she's a star for not supplying me with enough pickle and pushing me right to the edge..I had nochoice but to start making my own! I haven't seen blood oranges around here. Perhaps I am looking in the wrong places! Where and when do you find your blood oranges? Bee, what sugar did you use? And if you used brown / raw cane sugar, has it affected the color any? Anita, if it's ready by the end of June, most of it will be given away. And I will have to start over. The limes do not retain their color and become yellow. It's partly from the turmeric and partly from the bleaching by the sun and the acids. My green chillies also lose their color and become pale in comparison to the lush green of the chillies in the pickle my sister makes. The difference could be due to difference in the fruit itself. Limes are not nimboos. And I think the bright CO sun plays a role, too. My pickles have had only a day of sunshine and very few of the limes are the green they were yesterday. This is how it looked before I mixed it. I didn't take any pictures today, though. Mandira, do it while your lemons are still fresh and juicy. Also, see what Pel has to say about warmth and sunshine. My lime pickle got, on an average, 4 hours of sunshine daily cos I made it in July last year and we had many overcast days with lots of storms. Kalyn, I hope you get a chance to do so. You can use less red chilli powder and substitute the rest with red cayenne powder instead. I've been doing that a lot lately! Inji, you're most welcome and you reminded me that I still have to make your naranga curry. Add one more to my list! Swapna, I wouldn't advise making this in a metal container. Run out to Walmart (or if you hate Walmart, go to Target) and look for a glass jar or a barni-like container. Don't fuss over the sun quotient people - my MIL never put a jar of any kinda pickle in the sun. The sun just helps it cook faster I think. But she also used to heat her oil first. Punjabi pickles are always cooked int he sun, and since they use unheated mustard oil, it needs to cook in the beautiful winter sunshine for quite some time. So the lime green will fade. As does the sunny yellow nimboo- becoming red (or yellow, depending on the pickling spices) and then really black (if you ever get to keep it long enough). The Punjabi's believe the older the lemon pickle the more beneficial it is. And it really does perk up the appetite in this stifling heat when eating and cooking are furthest from your mind. manisha, i've forgotten what white sugar looks like. raw cane sugar is not that 'dark' really. it's golden rather than brown. HKG, I'm sure you and your wife make exquisite lonche! Anita, the sun provides the warmth it needs for the pickling. Plus you get the goodness of the sunshine, that's my theory anyway. But I guess I will find out soon enough. It's been overcast all day today but witha high of 82F and a strong cold front is moving in. Within the next two days our high will be in the low 60s. Brrr! It's funny how 60s suddenly feel cold again! I will need to find a nice warm place for these two pickles. Manisha, I think Meyer lemon season might be over - they are usually around in late winter/early spring, and those too weren't in plenty this year because of the frosty conditions in winter. I pickled them last year. I was totally amazed by the no oil pickles. Thanks a tonn for the wonderfull writeup and recipe! I use a heavy, old-fashioned stoneware crock for this- the pickling is really done by slow bacterial action that devour the carbohydrates and sugar and secrete lactic acid, making it sour and preserving the fruit. Many of the spices in your recipe also retard the growth of any inedible micro-organisms. The salt is absolutely necessary to provide the right environment for edible bacteria to flourish as well, so the salt cannot be left out or reduced. They prefer a temp of 60-80 (I might be mistaken, it could be 60-100) F/ 16-27 (38?) C for maximum speed and action; it's just slower if the temp is lower or higher than that, but it cannot be allowed to freeze of course, nor boil! Sitting in a sunny window is perfect! The best thing is to just keep it stirred daily to avoid any mold growth before the acid is high enough to thwart it, and keep testing the softness...and as beautiful as glass may be to view the operation in action, it will allow the sun to bleach the colour from the pickle- I learned this from a batch of pale kimchee I made this way many years ago. The taste was still good, but I've collected a stock of small crocks now just because I'm a hot-sour-salty freak. 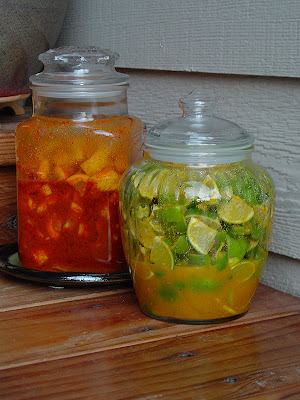 More on pickling may be read here. There Pel reveals the molecular gastronomy ...traditional Indian barni or martaban are stoneware jars - and now we know why! Thank you, Pel! But glass looks ohh so se.. ahem, pretty. Also, makes it easier t identify the pickle if you have many...more than 20 maybe! great timing.. now the sun is beatingdown on us , so its good to see ur pickle post. BTW, tya amritsari wadya vaparlya kaa? I'm with TheCooker : ti amritsari wadi waparli kaa? Ekach hoti naa? :-D That weekend never came, and now you have much bigger plans! ET, apparently they had some the previous week but the crop was not as much as previous years cos of the frost. Lucky you! To have easy access to so much wonderful fruit and produce! My friend who lives in Cupertino discovered that she has a lemon tree in her patio garden and whenever it produces fruit next, I am going to get a boxful! Yay! Roopa, you're most welcome. Let me know if you make it! Pel, who's the real TLO? :-D I am only a pretender! Thanks for all that info! Barnis were used traditionally but I had none. My sister confirmed that glass jars work well so I went ahead and used mine. Besides, I like to look at the pickle through the glass. I shake mine vigorously at least 4 times a day. Once when I put it out on the east-side, then when I move it further out on the patio, then when I move it to the west-side and finally when I bring it in. I haven't opened mine since I put them together. Anita, I like to look at them through the glass, too! Maybe I will make the next batch in stoneware, if I get there at all! Mallugirl, lucky you! We had high winds through most of today and they are going to continue into tomorrow. It was warm during the day but temps started falling and the high tomorrow is going to be in the 50s. 82F today. 54F tomorrow. Typical Colorado weather for you! So my pickles will stay indoors tomorrow! TC and Anita, muhurta shodath ahey. (Looking for an electional time.) For the Amrisari wadi. And yes, it was only one. Which is why the muhurta is so important. Yeah...when are we gonna see a dish with the Amritsi wadi? Pel, that should be ....when are we gonna see a recipe! First she revisited vaangi baath, now she's shouting about lemon and lime pickles she already posted last year. Thankfully we had some berry shrikhand in between, which I cannot make since there are no berries in Delhi, and amrakhand is so passe (TH loves his mangoes, and his shrikhand, just not mixed together). stop tormenting the poor gal, will ya? she's busy nursing her wounded leg and her soul. plus that bump from the plate has only begun to subside. Yes, stop tormenting the poor girl! Go fix yourself some real chai. Like one with a green chilli in it! It beckons. Soul? What soul? Her sole is fine! I will be making another batch! Anita, and so is the sole from the sea. Have you ever eaten it? It has a very delicate flavor. Yum! RP!, yay! Let me know how they turned out. Mine are cooking away in the sun!